Despite the ever-present advice that long-tail keywords are king, many businesses still struggle to strategically use them to get content to the top of organic and paid search results. The truth is, tackling these long-tail keywords feels hard when you know you're up against the giants. I know. I worked with many startups before I joined HubSpot, and scouring Google Keyword Planner every day for keywords to fuel my blog posts drove me close to insanity. But -- it worked. When I skipped the keyword research, convinced that my blog post was just THAT epic, THAT viral … I was wrong. I was chasing an immeasurable goal (virality) with an unaccountable metric (my gut). That kind of strategy is really only a luxury restricted to those with pre-existing ample website traffic, sizable social media following, copious brand advocates, and a list of high-profile customers. So if you're one of those companies without those luxuries, listen up. I'm going to show you how to uncover new keywords to target and assess if you're already targeting high-value phrases. If you want to generate more organic traffic, it’s necessary to find the sweet spot between easy-to-target keywords and keywords relevant to your business. A great (and familiar) place to start is to simply type some phrases into Google’s search bar, and watch how it pre-populates the rest of what you are typing. Google’s search bar algorithm is built around a searcher’s intent. Beware, though: What is suggested is not just based on popularity or relevance, but it's also personalized to the searcher. This exercise is simply to get you started with some ideas for keywords to target, and is by no means sufficient step on its own to do comprehensive keyword research. 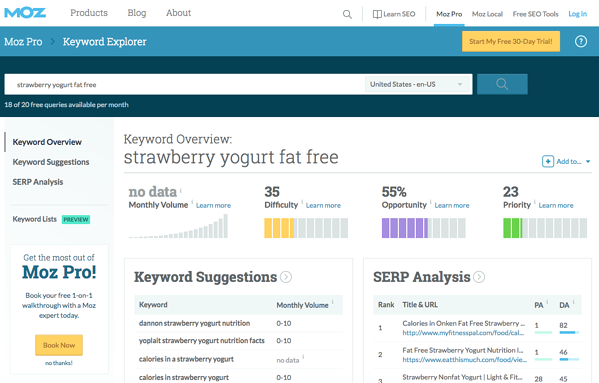 This keyword explorer is one of the best free SEO Tools available, providing an all-in-one tool to both discover and prioritize the search terms you'll want to target. Google Trends, if nothing else, an incredibly cool resource for trending search data. 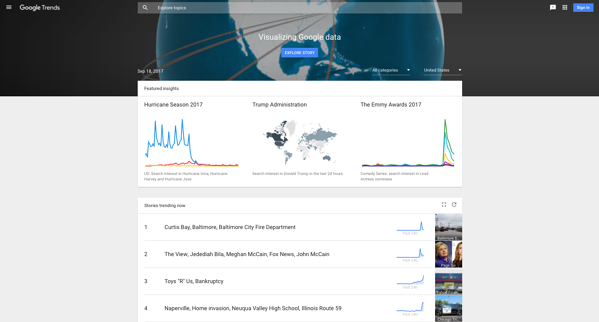 Not only does it provide information on search trends, but it also provides great visualizations that represent the data in a highly consumable way. You can also narrow the information by location. 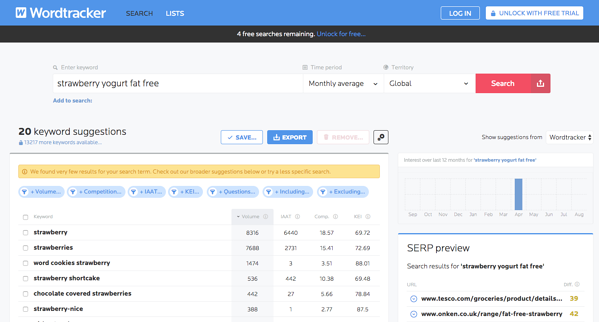 One of the best things about Wordtracker is that it helps users conduct keyword research across a variety of platforms. In addition to Google, for example, it helps marketers discover search term data for YouTube and Amazon, as well. 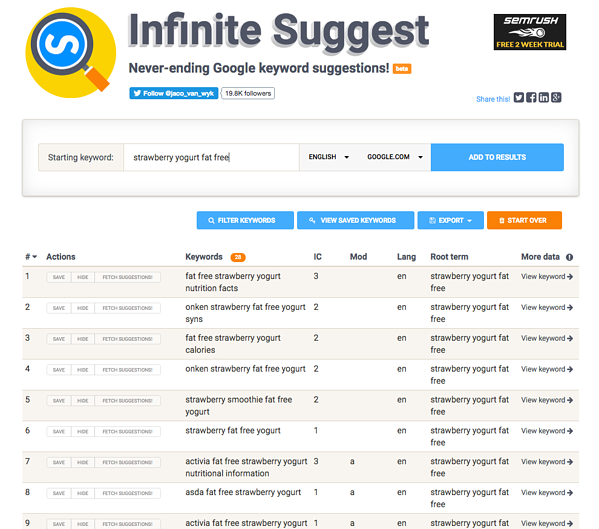 Keywordtool.io is, as the name depicts, a keyword research tool. What’s awesome about this tool is that it includes not only Google.com, but also all Google localized search languages, as well as YouTube, Bing, and the App Store. Sweet! Type in the ideas you recorded from the previous step, and expand your list. As you go, make sure to remove keywords you know deep down cannot be relevant to your website. This will save you time and money in the long run, and result in a far better experience for the web searcher. Trickery is a fool’s game! 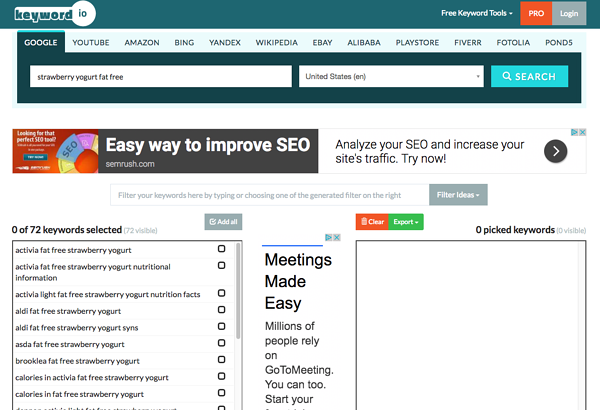 Keyword.io has the disadvantage of only using Google data, but it's handy in that it not only does keywords, but also looks at Google Trends information and lists the pages you have to beat for that keyword. You’ll need to have a long long list of keywords in order to boil it down to the golden nuggets. This tool will help you generate lots of terms (as it claims, “infinite”), and it's up to you to pick out the best ones. How many extra clicks will I get if I move up in Google’s results? How much money will I make if I move up? How strong is the page I’m trying to outrank? 1) How many extra clicks will I get on a keyword or phrase if I move up in Google’s results? 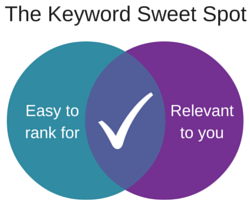 Export your keywords and work out your CTR averages. This exercise is about predicting how many extra clicks an increase in rank would bring for a particular keyword. You may have seen clickthrough rate (CTR) studies such as this one in the past, but they’re anecdotal at best because every website is different. We recommend you start by defining averages specific to your own website before working out click scenarios in different ranking positions. Once you know what your averages are for search queries, CTR, and position, you can start creating ranking scenarios for each keyword (e.g., if I move from position 10 to position 9 I will receive 12 extra clicks based on site CTR averages?). Be mindful though: If a keyword over- or under-performs compared to the site CTR average, you may need to adjust the expectation for its growth accordingly. 1) Log in to Google’s Search Console, navigate to the "Search Analytics" page under the "Search Traffic" header, and select the widest date range available on your website. This is typically 90 days. Once you have these averages in hand, you can calculate which phrases will result in sufficiently more clicks for the effort put into moving up the rankings for that keyphrase. 2) How much money will I make if I move up in the rankings? 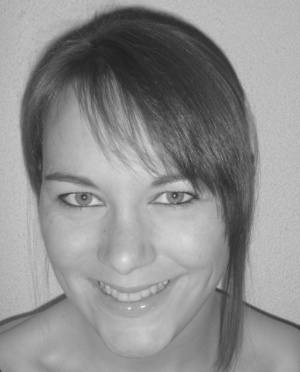 Add conversion rate and value to your CTR calculation. The data gleaned from your keyword export can be enriched with your company's financial information, such as the average value of a conversion and the average conversion rate. That way, you can project how much of a bottom-line impact your rankings changes could have (e.g. if an order value is $200 and conversion rate is 3%, how much more money will I get if I get 100 extra clicks from moving to a top spot in Google?). 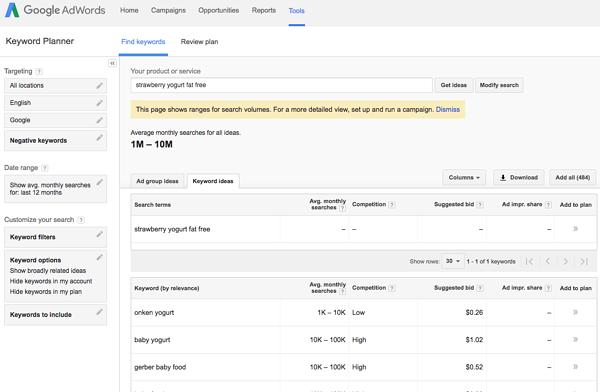 You can now prioritize the keywords that drive the highest potential revenue on your website. 3) How strong is the page I’m trying to outrank? Find results above you and look up their strength metrics. Finally, once you have growth potentials calculated, it’s recommended that you balance them out with a difficulty metric. I personally use Flow Metrics from Majestic, but you can also use Moz’s Page Authority or similar values. These providers provide API access, too, so you can automate your research as well. Advanced users can also map all keywords to their corresponding URLs, sum up potential scores from all keywords that lead to a URL, and end up with a list of priority pages to work on. I use this exact methodology for my own research, and if you’re curious as to how it works, you can check it out. Getting your keyword strategy right is the recipe for a long-term return on investment in digital marketing. Unlike other types of promotions, organic traffic is the gift that keeps on giving. Even when you're not actively publishing new promotions, you're still receiving traffic to your website. Remember: SEO is about serving the searcher with the best possible result. There are people out there searching for your very business, and you need to get in front of them. As your authority grows based on less-searched long-tail keywords, you’ll be able to tackle the giants as good as anyone. Want even more tips? Check out the video below.